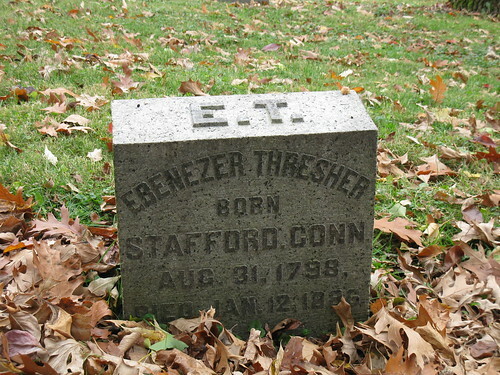 Ebenezer Thresher was born August 31, 1798, in Stafford, Connecticut, the ninth of the twelve children born to Ebenezer Thresher (about 1756-1832) and Hannah Blodgett (1762-about 1840). Ebenezer’s father, a farmer, failed in health in his early 50s. Ebenezer’s older brothers sought work outside the home to support the family; meanwhile, 12-year-old Ebenezer and his sisters were left to care for the farm. Ebenezer was promised that when he reached 18 years of age, he would be released from his family obligations and be permitted to set out on his own. In the winter of 1817, as he was preparing to leave home, he had a religious conversion. He was baptized in March 1817 at the Stafford Baptist Church [see current photo of the church], of which his mother was a member. He then decided to remain close to home for another year, to save money for a formal education. In the early spring of 1818, Ebenezer obtained better-paying employment in New Haven, walking the 60 miles on foot, over the course of two days, to reach the city. He first worked as a farm hand for one employer; he then later cared for the garden, carriages, and horses of another. 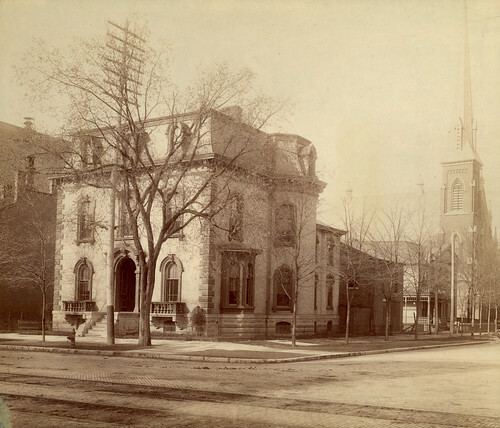 While in New Haven, he was involved with the Baptist church there. By April 1820, Ebenezer had accumulated a few hundred dollars to put towards his education. He traveled to Worcester, Massachusetts, to seek the instruction of Baptist minister Rev. Jonathan Going, who received his new student genially. However, as Ebenezer soon found Going to be “a good adviser but a poor teacher,” he moved to Bellingham, Massachusetts, to study with Baptist minister Rev. Abiel Fisher. In the spring of 1821, Ebenezer entered Amherst Academy (which became Amherst College later that same year) at Amherst, Massachusetts. 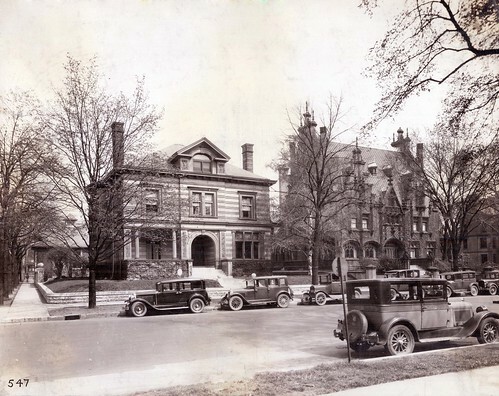 One of his classmates at Amherst (and later at Brown also) was John Pratt, who was later the first president of the Granville Literary and Theological Institution (now Denison University). In 1823, Ebenezer Thresher was granted a license to preach by the Stafford Baptist Church in his home town of Stafford, Connecticut. Two considerations influenced me more particularly in selecting this as the place of my future studies. One was the prospect of procuring there some pecuniary assistance. The other was an opportunity of obtaining a better knowledge of the world and of the forms and usages of society, in which I knew myself to be sadly deficient. 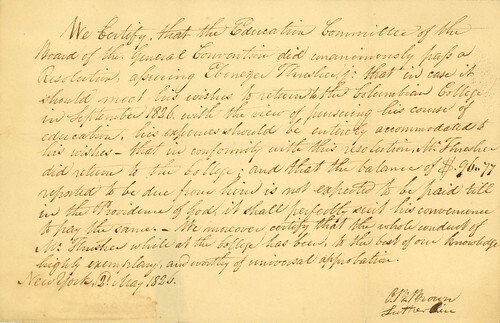 In 1826, Columbian College suffered some significant financial embarrassments, and many students, including Ebenezer Thresher, decided to continue their educations elsewhere. Ebenezer sought and was granted admission to the junior class at Brown University, in Providence, Rhode Island, in June 1826. Ebenezer Thresher graduated from Brown in 1827, as a member of the first class to be taught by Francis Wayland. He remained at Brown for another year of post-graduate study. On September 13, 1827, in New York City, Ebenezer Thresher married Elizabeth Fenner. Elizabeth was born in Canterbury, England, about 1804, but immigrated with her father to Poughkeepsie, New York, as a small child. Ebenezer first met Elizabeth while he was a student at Columbian College: she was a teacher at a mission school of which he was superintendent. They became engaged in the summer of 1826, when she was visiting Providence. In the fall of 1828, Ebenezer Thresher became the pastor of the First Baptist Church in Portland, Maine. He had been licensed to preach in 1823, and on December 18, 1828, he was ordained in Portland. This, his first and only pastorate, was short-lived (only 15 months), as his health and voice began failing him, partly due to the climate. On March 14, 1830, Ebenezer offered his resignation, which was accepted. Therefore, in 1830, Ebenezer Thresher and his family moved to Boston, Massachusetts, where the Northern Baptist Education Society was based. Ebenezer remained in this position for fifteen years, traveling to Baptist churches throughout New England during the course of this occupation, until 1845. 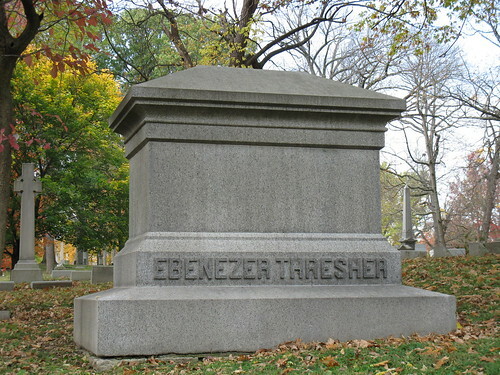 During the same time frame as his work with the Northern Baptist Education Society, Ebenezer Thresher aided the Baptist religion in a number of other ways as well. Ebenezer edited The American Baptist Magazine from 1831 to 1832 and The Christian Watchman from 1834 to 1836. He was a delegate to the Baptist Triennial Convention in 1835 and afterward. He raised $20,000 for the Newton Theological Institution (in Newton Centre, Newton, Massachusetts), served as one of its trustees from 1836 to 1843, and was its treasurer in 1843. 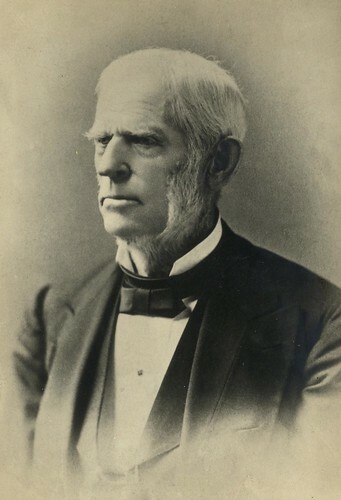 He also served on the Board of Trustees of Brown University from 1842 to 1848. Ebenezer Thresher’s health continued to decline over the years. By 1845, his doctors thought it unlikely that he could survive another year in the New England climate, but they suggested that a change in climate might preserve him. (He was, at that time, about 46 years old.) Therefore, he decided to visit Ohio, where one of his older brothers had removed several years earlier, with an interest in making it his permanent home. In the summer of 1845, Ebenezer Thresher traveled to Maryland, where he boarded the Baltimore and Ohio Railroad, bound for Cincinnati, where he visited his friend R. E. Pattison in nearby Covington, Kentucky. Someone apparently suggested that Ebenezer should visit Dayton, so he boarded a canal boat on the Miami Canal, bound for Dayton. During this journey, he encountered Samuel Forrer, who had been the principle engineer on the Miami Canal and was then a member of the Board of Public Works. 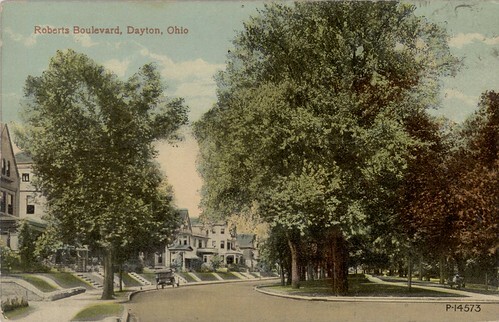 Forrer lived in Dayton and gave Ebenezer a positive impression of the city, and so Ebenezer Thresher decided to locate there. Upon settling in Dayton, Ebenezer Thresher joined the First Baptist Church, whose pastor was Frederick Snyder. One of the church members was Eliam E. Barney, who owned a saw mill on Wayne Avenue. 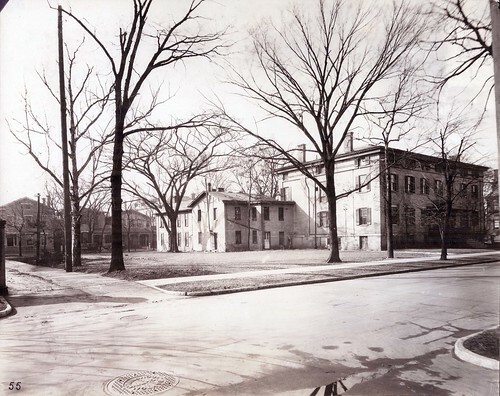 Barney wished to sell the saw mill so that he could become principal at the newly founded Cooper Female Seminary; Ebenezer purchased the saw mill in the hopes that working in the fresh air would improve his health. Ebenezer then took up residence on Jefferson Street, across from Market, and brought the rest of his family from Massachusetts to Ohio, by way of Buffalo and the newly completed Miami-Erie Canal. Whether due to the climate, the saw mill work, or something else, Ebenezer Thresher’s health did improve significantly within a few years. He lived in Dayton for more than 40 years. [Ebenezer’s] old friends in the East had reason to be surprised when he, to whom they had bidden good-bye as to an invalid preacher, again appeared among them engaging skilled mechanics to go west to build cars in a place where there was scarcely a railroad. By about 1855, Ebenezer Thresher’s health was again failing, and so he sold out his interest in the railroad car manufacturing company and permanently retired from it. 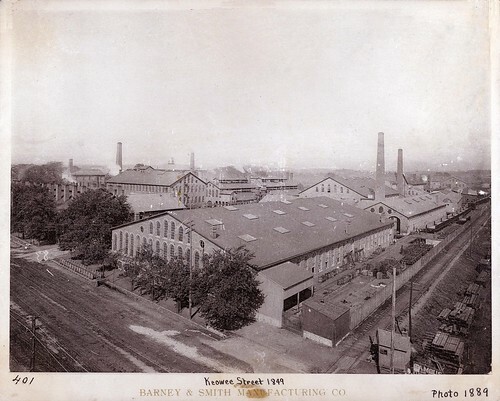 The company changed owners and names a few more times before becoming, in 1865, the “Barney and Smith Manufacturing Company,” the name by which it is best known. The company continued for many years after Ebenezer Thresher’s retirement. In about 1858, Ebenezer Thresher established, along with Charles F. Tower and his nephew J. B. Thresher, the Thresher Varnish Company. 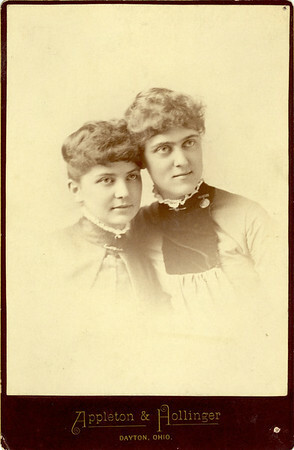 (Later on, Ebenezer’s son Ebenezer M. Thresher and nephew Albert Thresher were added to the company.) Tower was one of the manufacturing men who had come from the East to work at Thresher’s railroad car manufacturing company and had been in charge of the paint shop. At the time, there were only two other such varnish companies west of the Allegheny Mountains. The firm quickly found its products to be in high demand, due to the ever-expanding railroads of the west. Ebenezer Thresher retired from the varnish business on January 1, 1874, at the age of 75 years, and this company also continued for many years without him. On August 26, 1860, Ebenezer Thresher’s wife Elizabeth (Fenner) Thresher died. On December 5, 1861, Ebenezer married Martha Wilson (Henderson) Snyder, the widow of the Baptist minister Frederick Snyder, who had died in 1853. 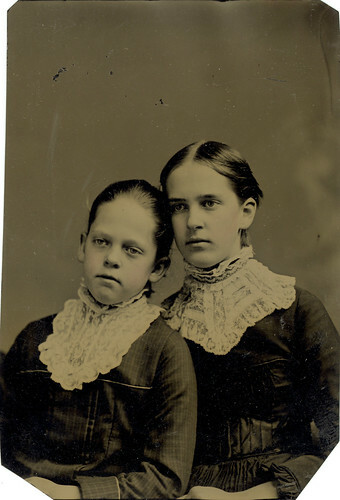 Martha was born in April 1823 in Dayton, and she had three surviving children with Rev. 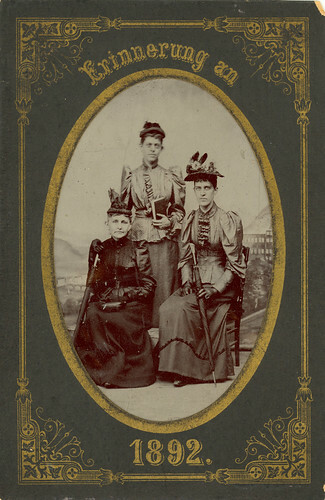 Snyder: Elizabeth, Charles, and Harriet. Sometime before his final retirement from business, Ebenezer Thresher built himself a fine new residence on the southwest corner of First and Main streets, two doors from the First Baptist Church. He lived the rest of his life there. Ebenezer Thresher had a deep interest in Denison University, a Baptist-affiliated college in Granville, Ohio. He made generous financial contributions to the school over the years. In 1857, he was made a Trustee of the university. 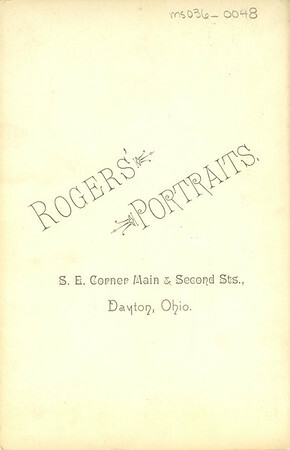 In 1875, Denison University conferred upon him an honorary Doctor of Laws (L.L.D.) degree. Ebenezer’s second wife Martha died after a brief illness on June 25, 1884, less than two weeks after the couple’s two daughters had graduated from Cooper Academy. The death of Ebenezer Thresher. It occurred yesterday morning [Jan. 12, 1886] at his home on the corner of First and Main Streets. He had been upon the streets the day before, and had risen in the morning apparently in his usual health, but while talking with his daughter in his library he was suddenly stricken with paralysis, almost immediately became unconscious, and, after two or three hours, quietly breathed his last. 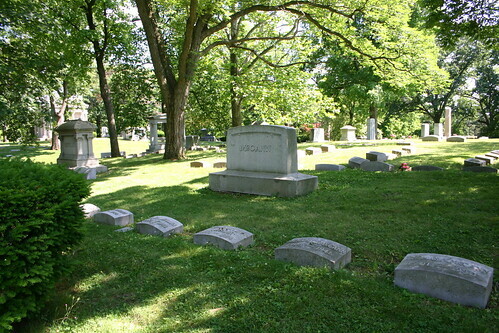 Ebenezer Thresher was buried on January 14, 1886, in Woodland Cemetery in Dayton, Ohio, next to his wives. Ebenezer M. Thresher (born Apr. 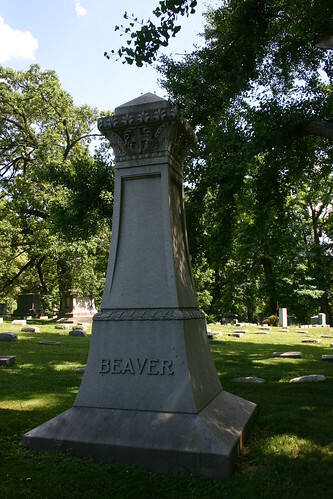 23, 1842; died Apr. 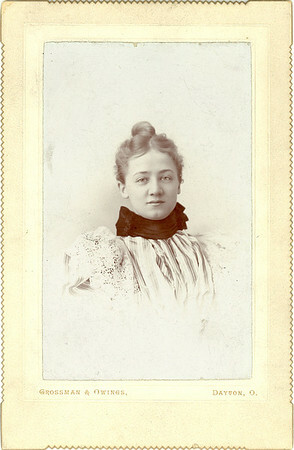 28, 1913), who married Lydia R. Bliss (1845-1919) and had two children. 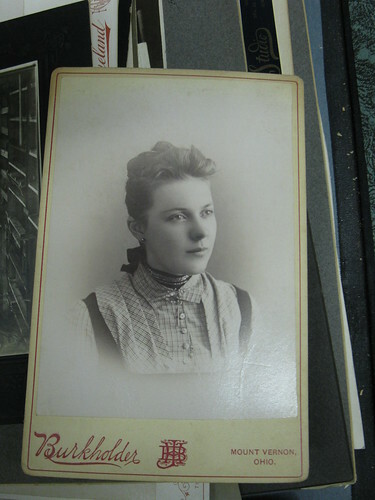 Harriet A. Snyder (born Nov. 1851; died June 29, 1925), who married Robert Newton King (1845-1942) and had two children. Henry F. Colby, A Tribute to the Memory of Ebenezer Thresher (Dayton, OH: United Brethren Publishing House, 1886), 3; Augustus W. Drury, History of the City of Dayton and Montgomery County, Ohio (Chicago: Clarke Publishing Co., 1909), 1:613; “Death of Ebenezer Thresher,” Dayton Daily News, 13 Jan. 1886, 3. Colby, 4-9; “Death of Ebenezer Thresher”; Historical Souvenir of the Stafford Baptist Church ([Stafford, CT: Stafford Baptist Church], 1909), 13, Thresher-McCann Collection (hereafter cited as TMC), 4:14, Dayton Metro Library (Dayton, Ohio). Colby, 11-18; “Death of Ebenezer Thresher.” In 1831, Rev. Jonathan Going was one of those associated with the founding of the Granville Literary and Theological Institution, later known as Granville College and now as Denison University. Colby speculated that Thresher’s fondness for Going influenced his later fondness for Granville College. Historical Souvenir of the Stafford Baptist Church, 13; Colby, 35. Ebenezer Thresher’s memoirs, quoted in Colby, 20. Colby, 35-39; “Death of Ebenezer Thresher”; Historical Souvenir of the Stafford Baptist Church, 13. Colby, 41-43; “Death of Ebenezer Thresher”; Historical Souvenir of the Stafford Baptist Church, 13. Ebenezer Thresher’s memoirs, quoted in Colby, 43. 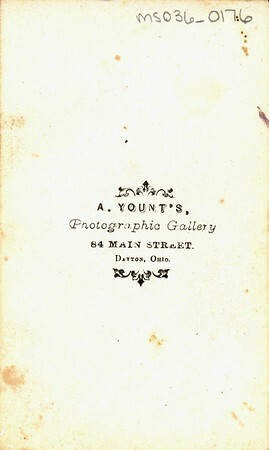 Colby, 67-68; Drury, History of the City of Dayton, 1:613, 2:557. Colby, 73; Drury, History of the City of Dayton, 1:613. Colby, 73; Drury, History of the City of Dayton, 1:613-614. Colby, 73-75; Drury, History of the City of Dayton, 1:613-614. Colby, 74-75; Drury, History of the City of Dayton, 1:613, 1:618-619. Colby, 76; Ohio Marriages, 1800-1958 (database), FamilySearch, accessed 4 Feb. 2011, http://www.familysearch.org. Colby, 84; Montgomery County Picture File, photo #1633, Dayton Metro Library. About 1894, Peter JoHantgen purchased the Thresher house, which he had disassembled and then rebuilt on the southwest corner of Third Street and Robert Boulevard. 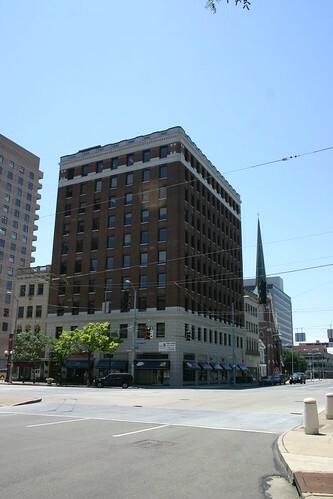 The southwest corner of First and Main was later the site of the Dayton City Club Building, which was razed in 1925, and the Harries Building was built on the site (Martin J. Kelly, “The Levee and Robert’s Fill,” 18 Mar. 1969, accessed 24 May 2012, http://www.daytonhistorybooks.com/the_levee_and_robert_blvd.html; Lutzenberger Picture Collection, photo #0221, Dayton Metro Library). 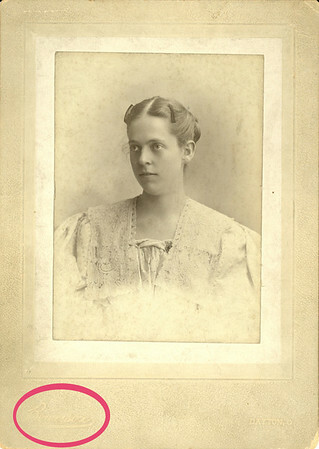 Colby, 87-88; Cooper Academy certificates and materials, Thresher-McCann Collection. Colby, 88-93; “Death of Ebenezer Thresher”; Woodland Cemetery & Arboretum Interment Database, accessed 29 Jan. 2011, http://www.woodlandcemetery.org. Today’s post is pretty light-hearted and silly, but hopefully you’ll enjoy nonetheless. When I saw this post from the Derangement and Description blog today, it made me chuckle. 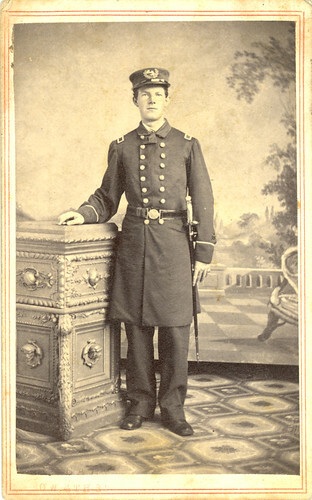 Apparently, the blog’s author Rebecca was one of the winners of the SAA haiku contest with her haiku (and visual aid) about a handsome man in a daguerreotype photo she found. Is it just me, or is it rare to come across a really old photo (say, 19th century) that depicts someone you actually find attractive? I suppose that is probably because we have different ideas today about what physically attracts us. For instance, the men in most of the old photos I’ve seen are usually — well, old, for one thing (maybe because photos were probably expensive and people didn’t spend money on them until they were already old and successful?) — and I think something about the hair styles — not to mention the beards; oh, they loved their beards! — back then just…well, they’re definitely not what you’d see on, say, People Magazine’s Sexiest Men Alive. She reminds me of a cross between Scarlett Johannson and Kristen Stewart. What do you think? I think it’s something about her eyes. And her skin. And her eyebrows. And her expression. There’s just something about her. Maybe it’s her hair. And although her clothes are plaid and plain, she looks like she’d be just as at home in a sequin gown. I can’t even picture this woman in a period-appropriate “fancy dress” — my imagination takes her straight to a red carpet. Well, anyway, there really wasn’t much of a scholarly point to this post (if any at all), but I just wanted to share some interesting photos that I found. 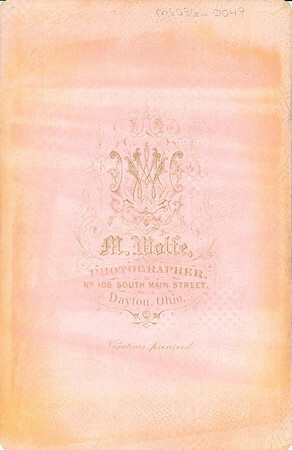 The material discussed here is from the Thresher-McCann Collection (MS-036), which can be found at the Dayton Metro Library, Main Library, Local History Room, 215 E. Third St., Dayton, OH 45402. For more information on the collection, contact the library, or feel free to leave a comment on this blog.